If you'd like full details on the consumer page, make sure you review our Managing Consumers article. You can filter by subscription status, subscription sign up date, and subscription cancel date. This is a quick way for you to see all your consumers in a particular group e.g. all consumers that have an active subscription, or search for specific consumers in a segment, e.g. find consumer X in the "cancelled subscription" segment. Don't forget you can always us CTRL + F to find a specific consumer within a filtered view. You can also select multiple filters at once for a more pared down view. Simply select the dropdown to view the filter options and select. The view will automatically update to show the filtered selection. 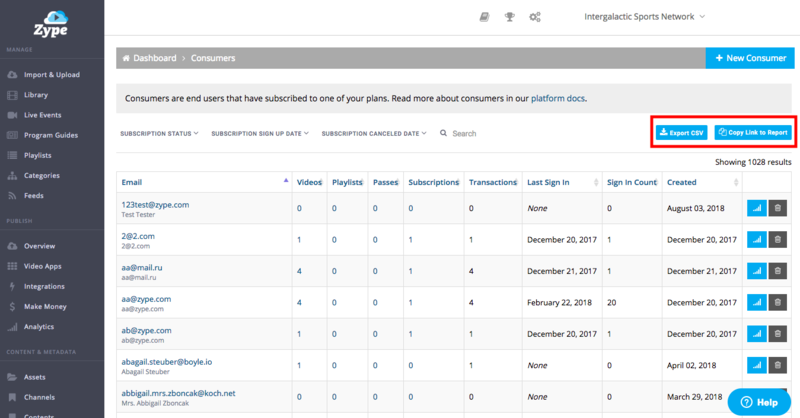 The subscription sign up date filter let's you filter by a selected time period and will return all subscription sign ups from that time frame. Simply select the dropdown to view the filter options and select. The view will automatically update to show the filtered selection. The subscription canceled date filter let's you filter by a selected time period and will return all subscription cancelations from that time frame. Simply select the dropdown to view the filter options and select. The view will automatically update to show the filtered selection. To search the entire consumer page for a single consumer, you won't need to utilize the filters. Simply enter the consumer name on the Search box, then click Search. You can also save and export filtered views for future use. After you’ve filtered your consumers to your desired view, you simply select Copy Link to Report to copy your filtered view link and bookmark! Visit anytime for quick access to your filtered list. To easily export a filtered view of consumers, simply select Export CSV. This can be particularly helpful if you want to export all your canceled consumers and import them into an email marketing tool like MailChimp or Constant Contact to target for a win back campaign.